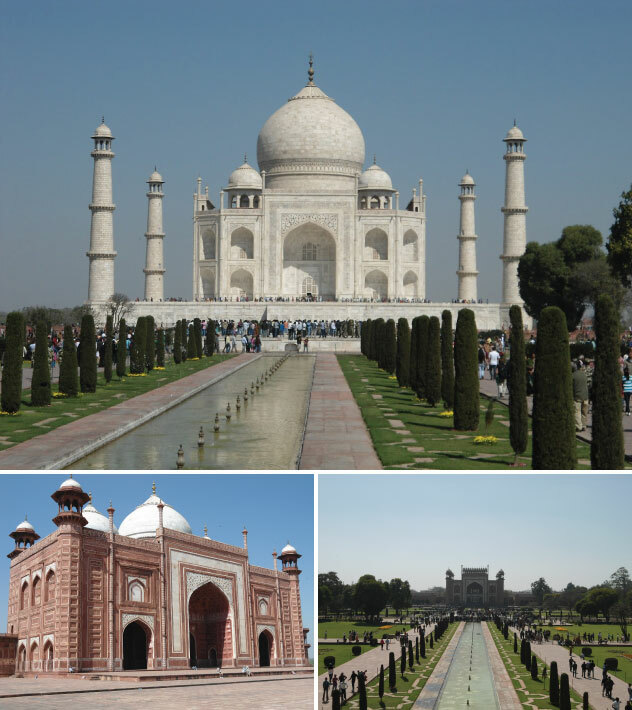 It's been a couple weeks since I returned from my India & China adventure, but I wanted to make sure I got to share the last of my photo favorites! You can't visit the other side of the world and not share it, right? So here's to a trip around the world that I was Head Over Heels for! I kid! I kid! But it was pretty hilarious :) Love that the waiter smiled for the photo too. 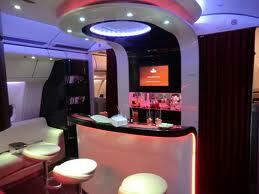 When our visit to India was over, it was time to head to Hong Kong for the next leg of our work trip. Once we got to the airport, we had a minor fiasco with India's airport security. A guard wasn't allowing one of my co-workers into the entrance lobby of the airport without a printed ticket. Isn't that what those kiosks are for once you get into the airport?!? Completely nuts, and annoying but thankfully we all boarded our Kingfisher Air flight- complete with tacky in-flight bar... weird. Here's my first glimpse across Victoria Harbor. Sadly it was really foggy, bummer. 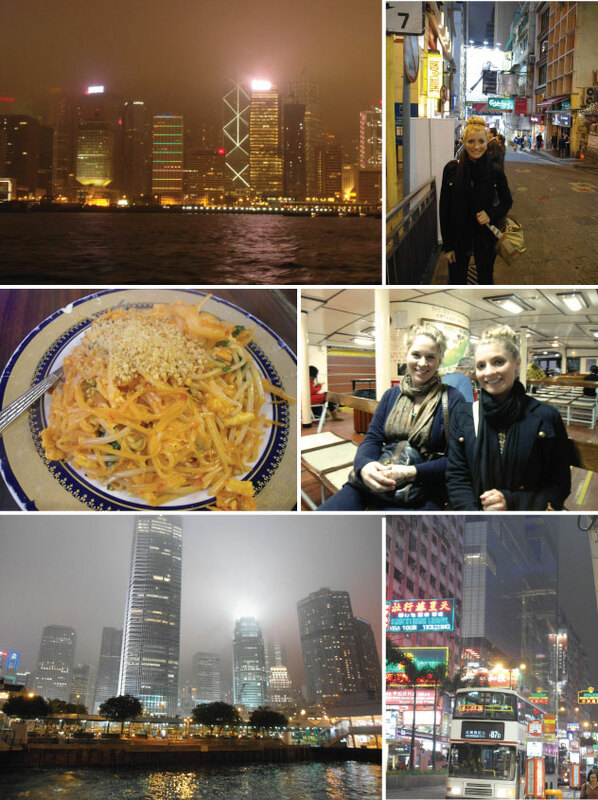 Later that evening we took the Star Ferry across Victoria Harbor to Hong Kong Island for dinner. We went to Good Luck Thai Restaurant located in the fun little Lan Kwai Fong﻿ district. The Pad Thai was amazing!!! The next day we were able to do a little shopping in the local market. I got lots of goodies for my family there! I noticed there were a lot of random street parades during the time we were there. Not sure what each one was for? The next stop on our trip was to Shenzhen, China. Thankfully it was only an hour car van ride from Hong Kong... and a 40 minute wait to get through customs with our trunk hanging open. 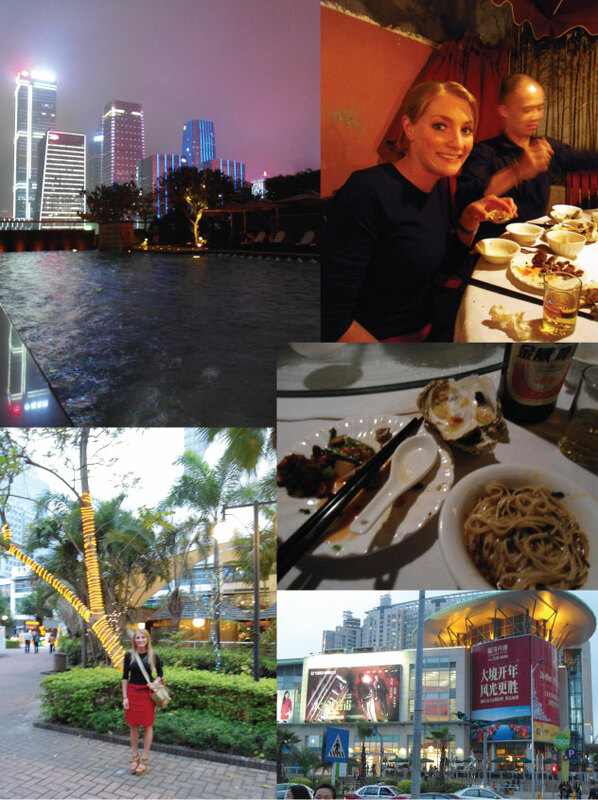 Aside from just the hotel (Ritz Carlton Shenzhen), I loved the city, the warm weather, and the food! My favorite dinner of the whole trip was at a Schezwan restaurant near the fun Coco Park district (full of great bars and restaurants). I even ate an oyster for the first time! 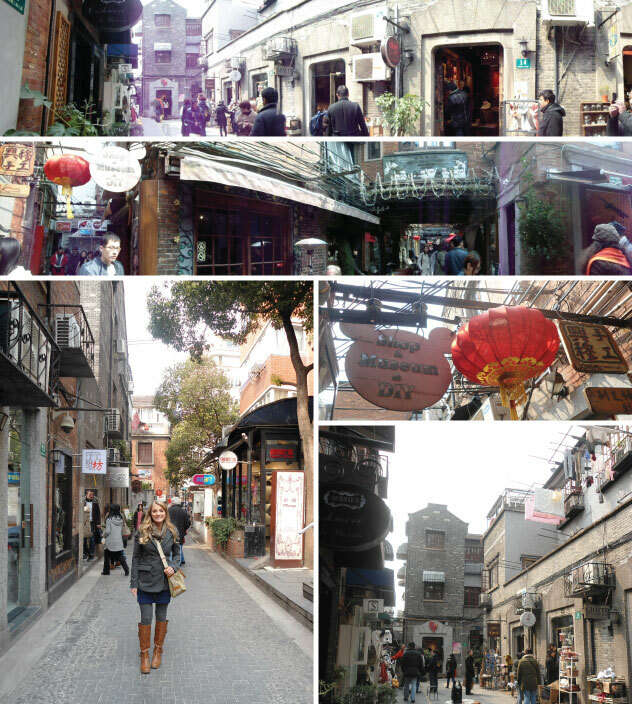 The next stop on our trip was our last one- Shanghai!!! 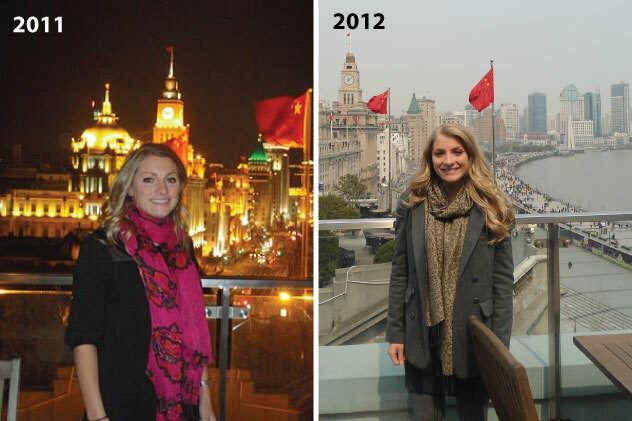 I was very excited to visit Shanghai because I had the opportunity to travel there last year and I loved it! ﻿Funny, the above photo was taken at the same restaurant that we ate at in 2011- New Heights. This time we went there during the daytime, so I got a whole new perspective for the view. The Bund was still dazzling! I was able to get a fun video of the view and you can hear some of the music that was being filmed. Later we got to go shopping in a fun little market area. I don't know the name of it, but it was all narrow little streets that winded around all over like a maze. It was crowded, but a cool experience. I even saw a "DIY" sign! During one of our work days (which means lots of ours spent riding around in vans) we stopped in Hongzhou for lunch. 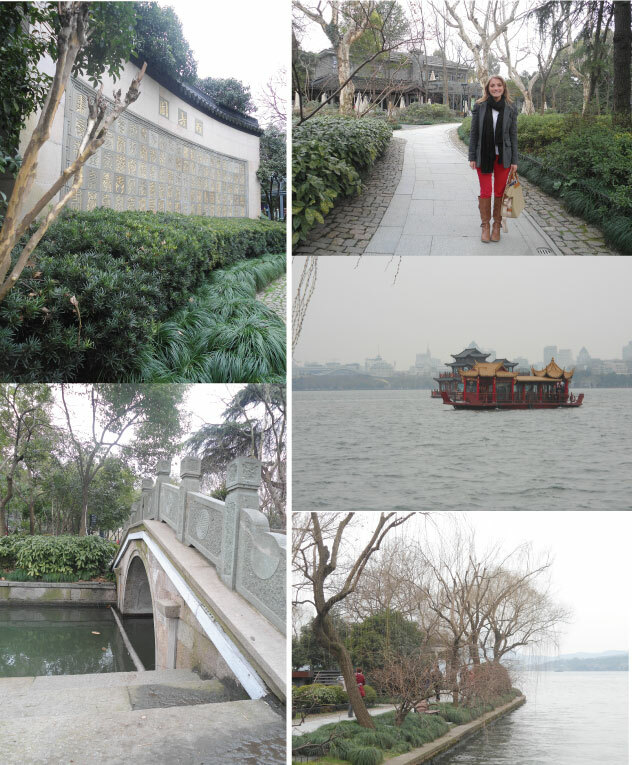 The lake and gardens were beautiful! ...which also marked the end to our 17 day work trip, we did what any American should do in China- Karaoke! That's a wrap on my adventures in India & China! I have to also mention that I feel very lucky to have had the experience with these amazing folks from work (yes, all warm and fuzzy). We made one heck of a team! I just should have been wearing my signature heels in any photo with them. My joke was always "hey, who brought the kid on the trip?" if I didn't have my extra added height, ha! 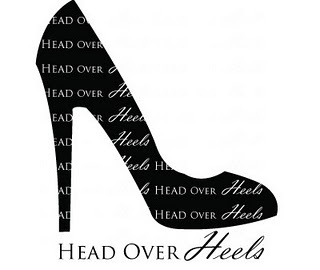 I bet you can see why it is this week's Head Over Heels post :) Hope you enjoyed the photos and a few fun stories from my trip! Now, onto a weekend full of projects! Guest Room: "Afters".... Take 4! 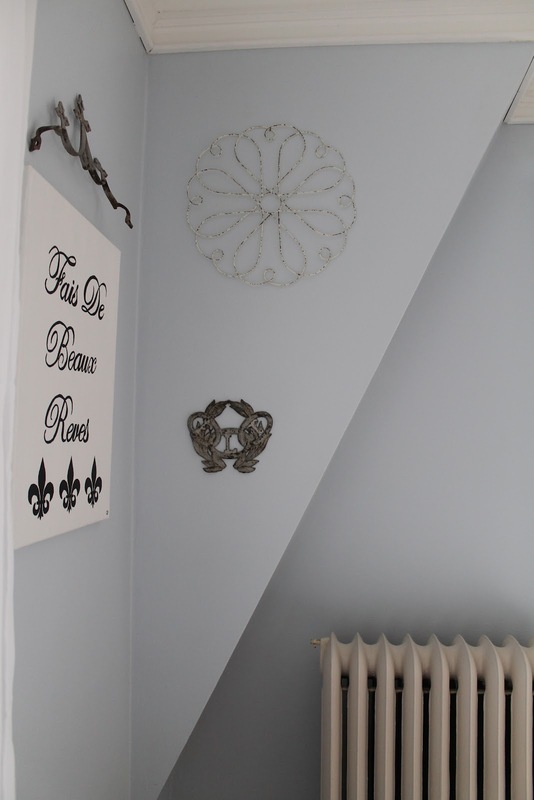 This is sooooo long overdue, but our Guest Room is finally in one (beautiful) piece... finally! The last time we ever mentioned our Guest Room was in this post, written before Thanksgiving last year. 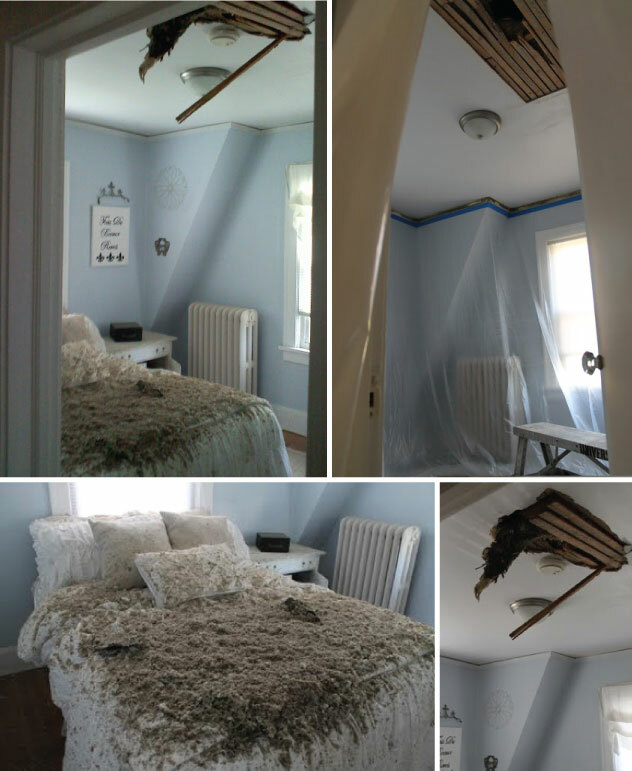 I had promised to show the "newest version" of our Guest Room, post tornado repair. I was wayyyyy off on that timing... I know, bad blogger! Since then I actually had most of the room set up and decorated but I kept thinking it wasn't complete or that it was missing something. I finally realized that it won't ever be completely perfect, and by then I will most likely want to change up the whole room (for the 5th time). Ha! Guest Room Redo: Take 1, Action! 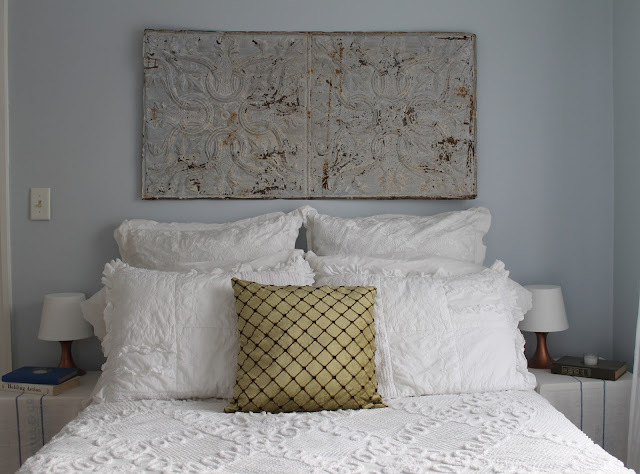 When we first moved in, the Guest Room was pale yellow with white carpet. We promptly started this redo by removing the icky old carpet and adding a closet door where one didn't exist (just had a curtain hanging). 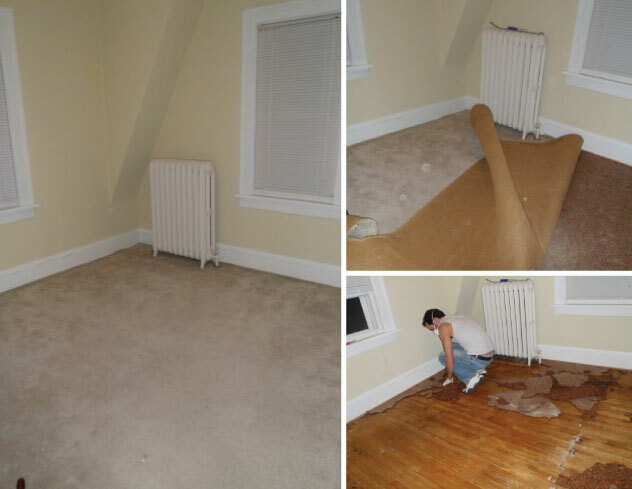 After that Alex sanded and refinished the wood flooring and we painted the room Behr's Cumberland Fog. We fit a bed and a couple other pieces of furniture in there and called it good for the time being. At least our guests had a place to sleep right? But yes, nothing special about version #1 of our Guest Room. 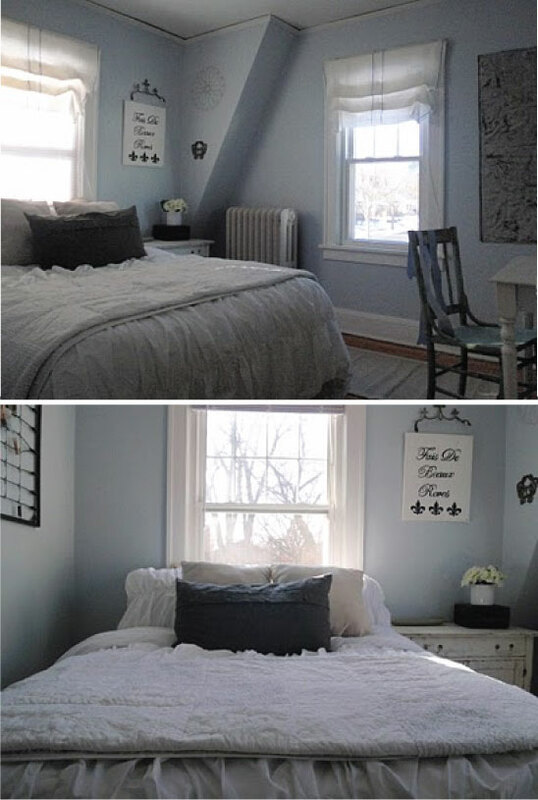 Guest Room Redo: Take 2, Action! Alex and I got super lucky when it came to version #2. Layla and Kevin Palmer of The Lettered Cottage were in Minnesota and looking to redo a room for someone... and we were chosen! Woo-hoo! Beautiful right? I loved all the vintage details and the way they set up everything we picked out while shopping. 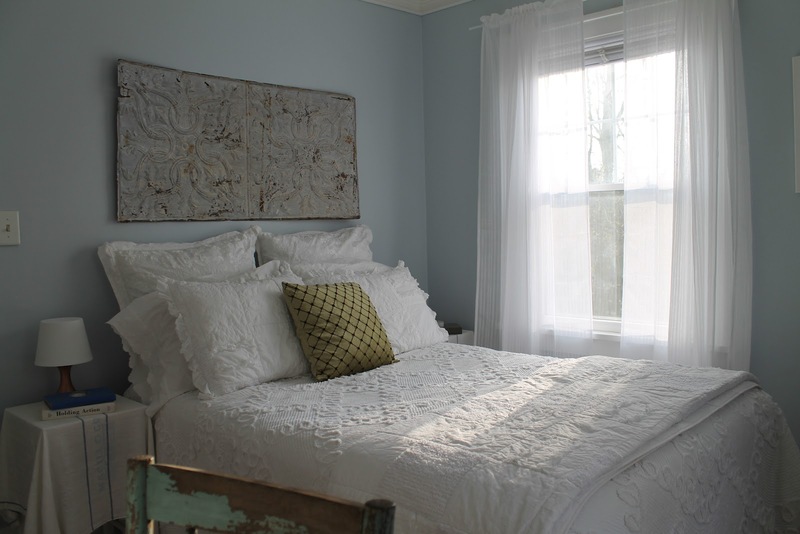 The Guest Room certainly came along way with their help! Guest Room Redo: Take 3, Action! 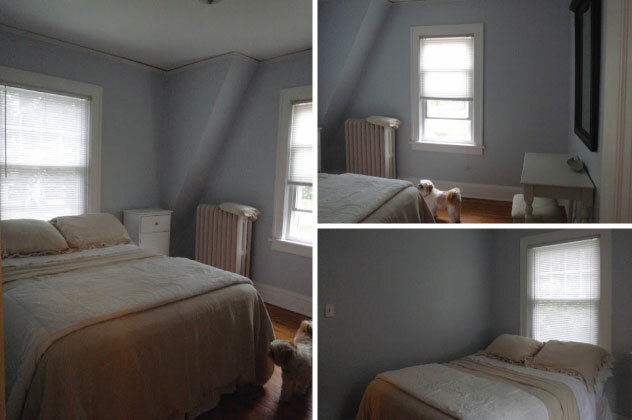 Version #3 of our Guest Room wasn't very different from what Layla and Kevin did because I loved it so much. The only little changes were adding those DIY vintage grainsack window shades, a new textured white duvet cover, and I moved the vintage dressform into my dressing room/ sewing space. 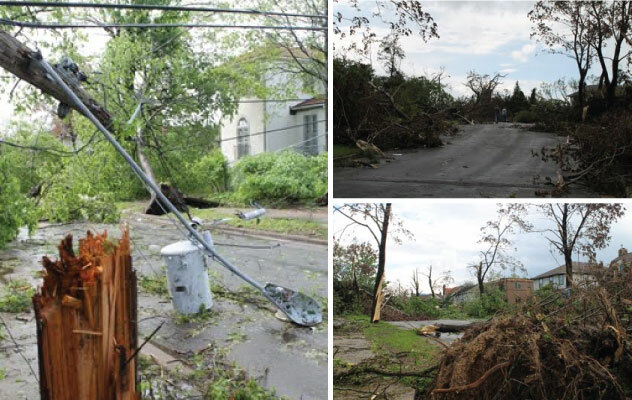 The neighborhood was a complete mess, yuck, I hate looking back at these photos! 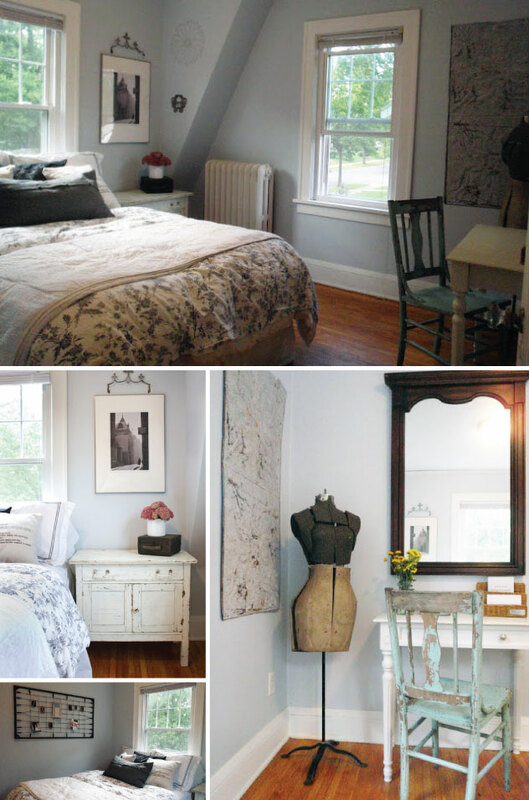 Guest Room Redo: Take 4, Action! Once the ceiling was all closed up we started putting the room back together. 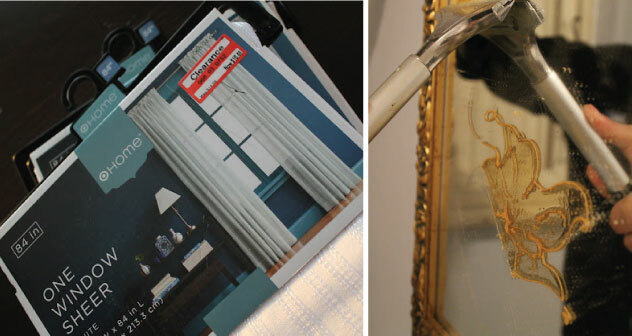 Since we were starting from scratch we decided to change the way the furniture was set up and add a couple new items including these window sheers from Target and an antique mirror (that we removed some weird flowers from). Hope you are ready for lots of photos now! 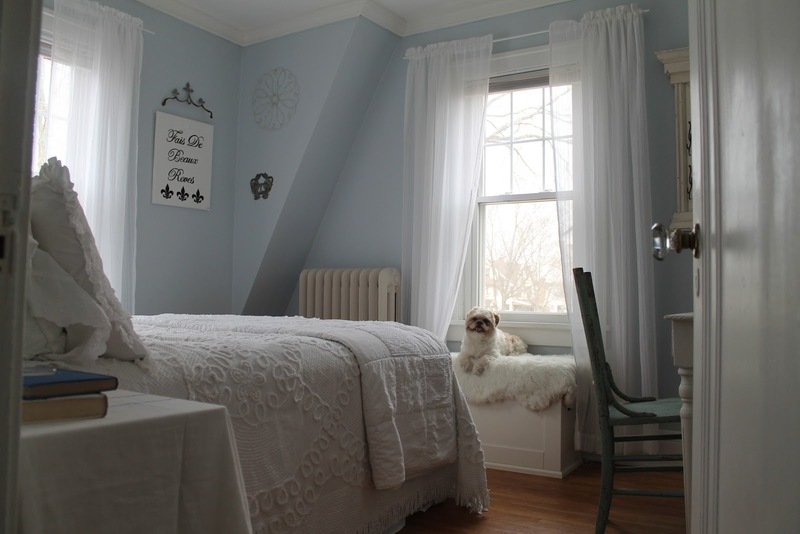 Here's a look at the whole room now (Shih Tzu not included). I guess the room is a little more feminine and elegant than the previous version? Our biggest layout change was moving the bed away from the window and against the longest wall. I kept the same desk and chair but added in that new antique framed mirror. 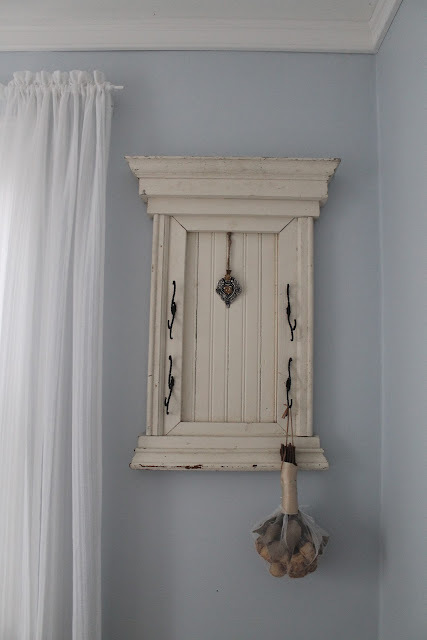 I got this vintage framed wall hook from the St. Paul flea market more than a year ago for $18. Glad it finally has a home in the Guest Room, I just love it! So unique! 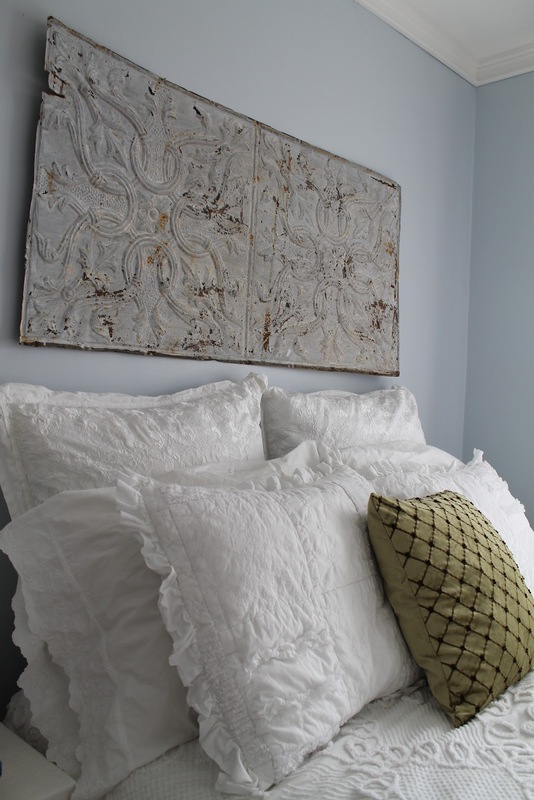 Our main reason for moving the bed against the longest wall was so we could hang that large vintage tin tile above the bed in place of a headboard. I still can't believe we scored that tile for only $20! So perfect with our paint color. I used two old stools from Ikea that we had in our basement as the nightstands on each side. I covered them with the vintage grainsacks that were formally used for the window shades. 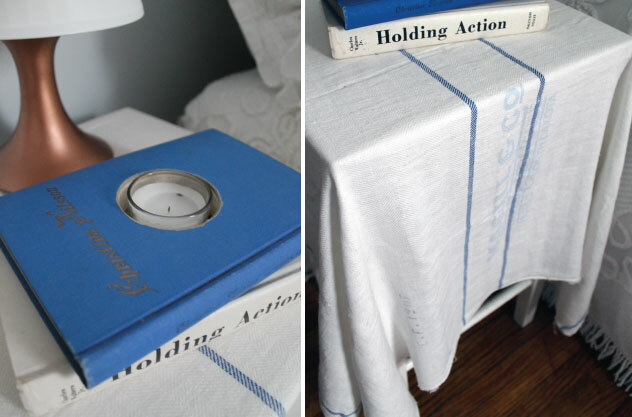 Our fun little creation was drilling a large hole into these old hardcover books and placing a candle in the center. 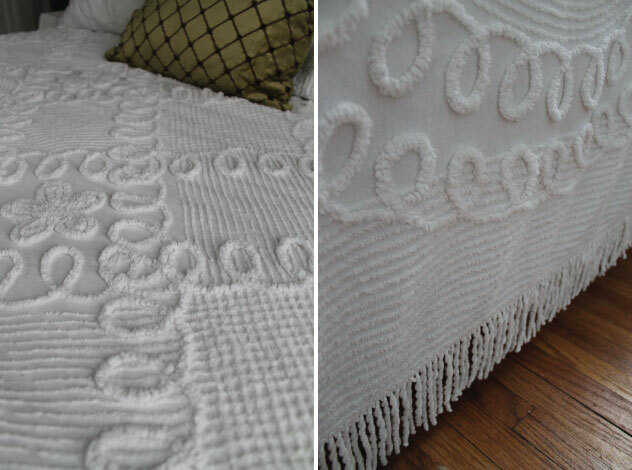 This chenille bedspread I picked up at a thrift store for $8.00! My grandma had one just like it in a pink/ white color combination, I couldn't resist! After washing and bleaching it looked fresh and beautiful. I love the pattern, texture and the little tassels around each side. 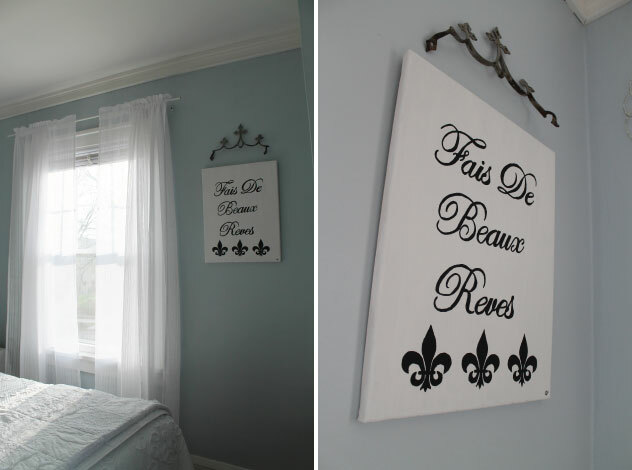 For the other wall art, I painted this little canvas that says "Sweet Dreams" and kept the widow's peak above it. The metal wire charger and vintage grave marker also remained in their old spots. 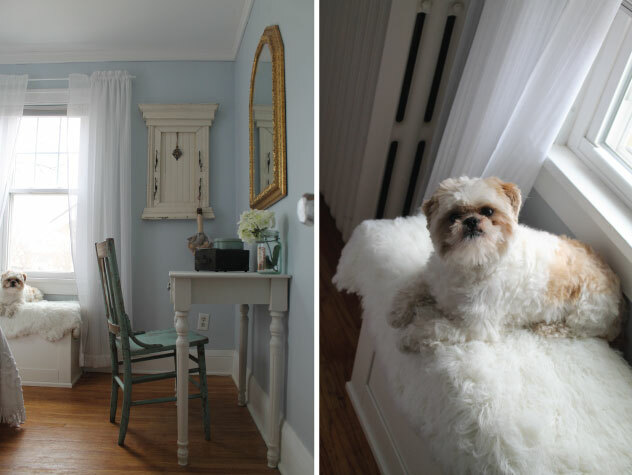 Did you notice a certain fluffy, curious little cutie-pie sneaking into my Guest Room pictures? Ever since I added that faux sheepskin throw to that window seat, Rocco has made it his little afternoon lounging spot. I was pretty shocked when he continued to sit there while I ran to grab the camera since he usually ruins cute photographic moments. Thankfully, I got a bunch of cute photos of him and I love that he became an accessory for the room, haha! He matches the color scheme and feel of the room pretty well, right?!? What did you think of Guest Room version #4? My parents are coming for an Easter weekend visit soon, can't wait to get actual Guest feeback then! It has been five whole years since we packed up that 16 foot Penske truck and headed to Minneapolis to start our lives as "grown-ups". Looking back now, I can't believe how much life has changed in those five years. 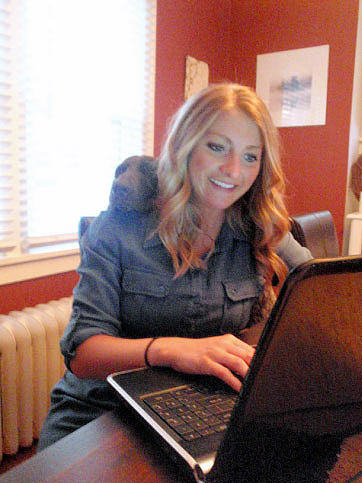 In 2007 I was 22 years old, geeked about accepting my first big job offer in the corporate world, moving to a bigger city with my hunky boyfriend, and of course making money for the first time (not counting minimum wage part time jobs in college). 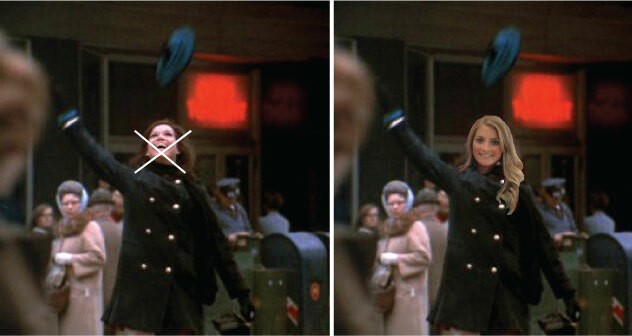 Just like Mary Tyler Moore, I was headed to Minneapolis and I was going to make it after all!!!! 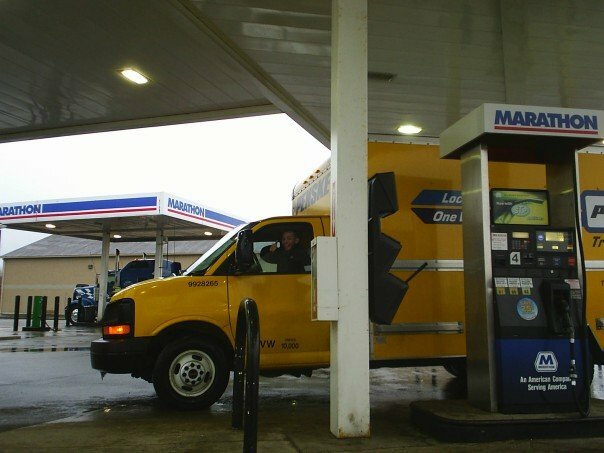 At the time it felt like moving to Minneapolis was a happy ending to the "life after college story" story. But that was only the beginning of our story. 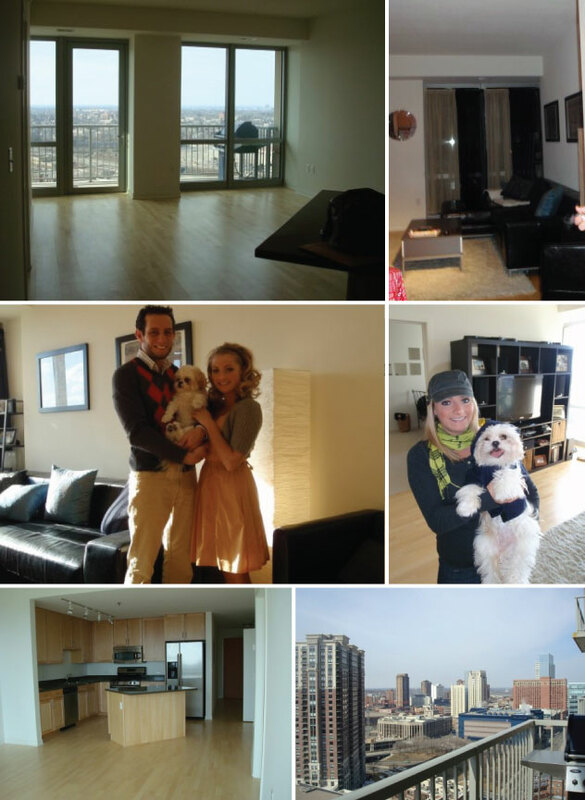 With the help of a relocation team, Alex and I settled into our first apartment. 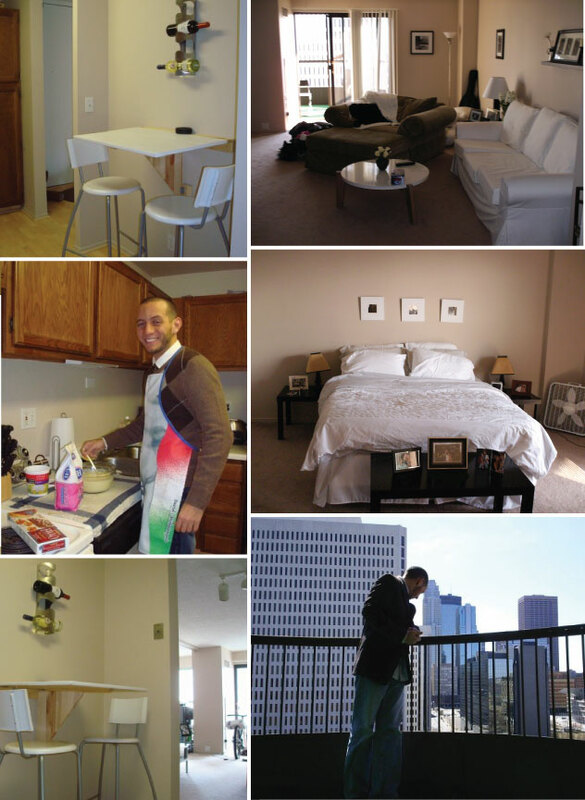 It was a little 1 bedroom/ studio apartment in downtown Minneapolis with a beautiful balcony view. Yes, we survived our first year living together in a studio type apartment- crazy! I don't have a ton of pictures of that apartment, these are the few that I have. 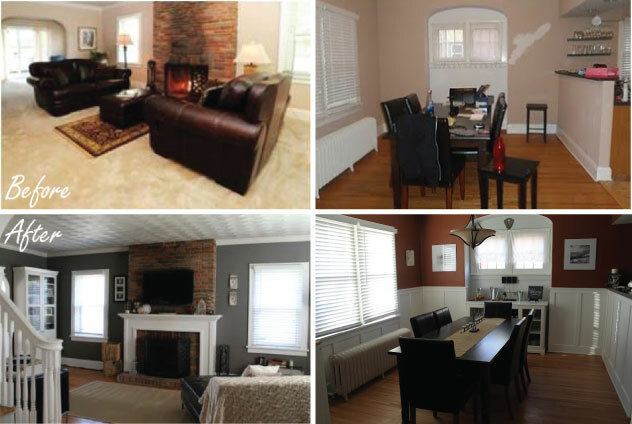 You can see in the bottom left photo that there isn't a wall separating the living room and bedroom. So Alex and I didn't have much space to ourselves... goodbye SSB ("secret single behavior")! Man, white and beige... everywhere! Barf! Funny to see how our style has evolved. Anyway, the next step we took together was getting our first puppy. 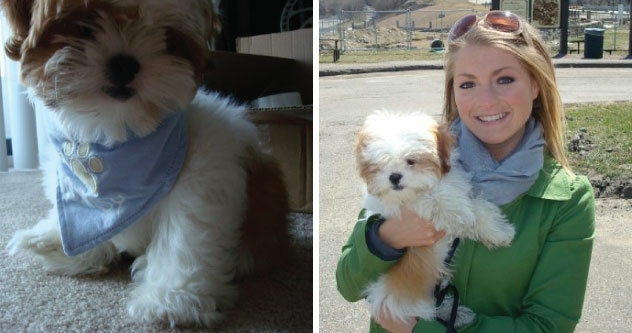 We found the cutest little Shih Tzu to take home and named him Rocco. Ugh, miss that cute little puppy size! When our one year lease was up at the apartment, we decided to move into a slightly larger place downtown that offered more space and privacy for Alex and I. We fell in love with this ultra chic condo and settled into home #2. Again, I don't have the best photos of the condo decorated (most are of us holding Rocco like a baby) but you can see our style was very clean and modern... lots of Ikea all over the place. A few months later, one of the most exciting events happened during a visit to Michigan. 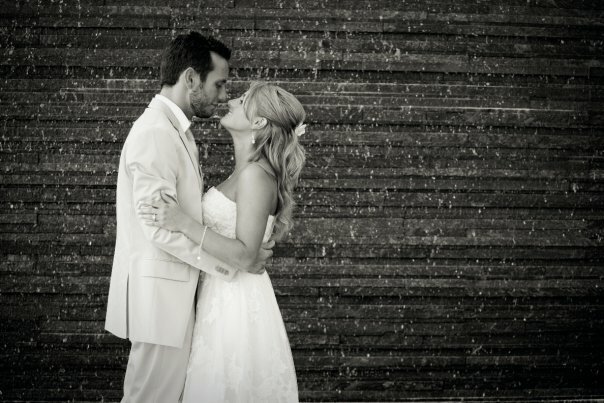 In the same location of our first spoken "I love you" to each other, Alex asked me to marry him. By now you know I said yes. Once we returned to Minneapolis and started wedding planning, we both realized that our condo wasn't going to be ideal for much longer. With the amount of stuff we were accumulating from/ for our wedding along with having to travel down 21 floors to take Rocco outside to pee made us realize it was time to get a house. 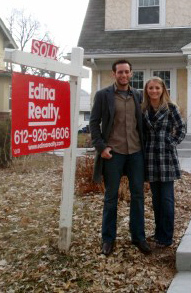 Three years ago on March 27th, we bought our first home and began moving in! 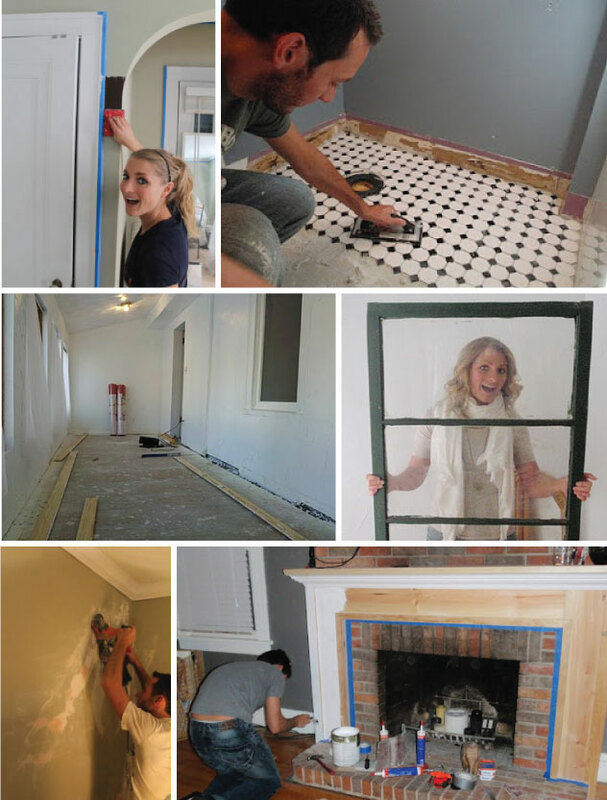 The day wasn't totally perfect (which is reflected in one of my first ever blog posts), but from that day on our DIY-ing and home renovation adventures began!!! After I officially became Mrs. Zidarevich, we thought it was time to have a little one... errr... another little one, in the form of a puppy. 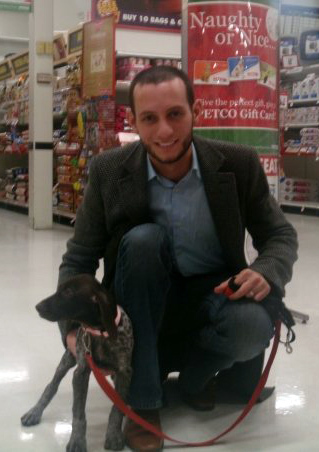 Rocco got his first sibling when we brought home our little German Shorthair Pointer named Sadie. 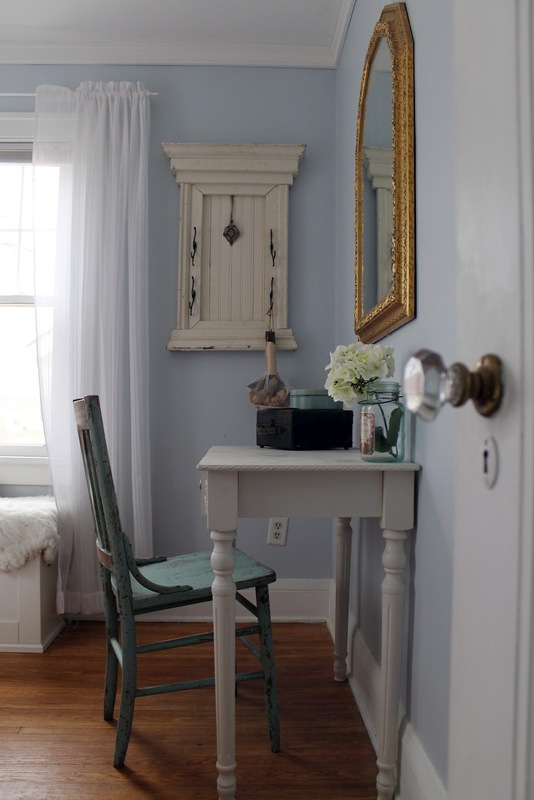 Which then lead to some other cool opportunities related to our blog... like getting a room redo for a possible TV show from Layla and Kevin Palmer of The Lettered Cottage blog (huge fan! 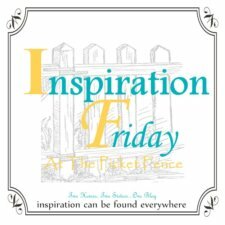 ), filming a segment for a local documentary about our neighborhood, and getting connected with so many people in the blog world that love what I love! Now, this post certainly doesn't cover everything from the last five years. Things like family visits, job promotions, trips, vacations, parties, etc., still happened and everday we are together brings new adventures along with ups and downs. But, I think that is a fun ~small~ glimpse of our story in the past five years making Minnesota home. So there you have it, five years in a FLASH! Are we "Minnesotan" now? You sure betcha don't cha know!